What does kai mean? How far does the kai go? What are some Hawaiian practices related to the ocean and ocean water? 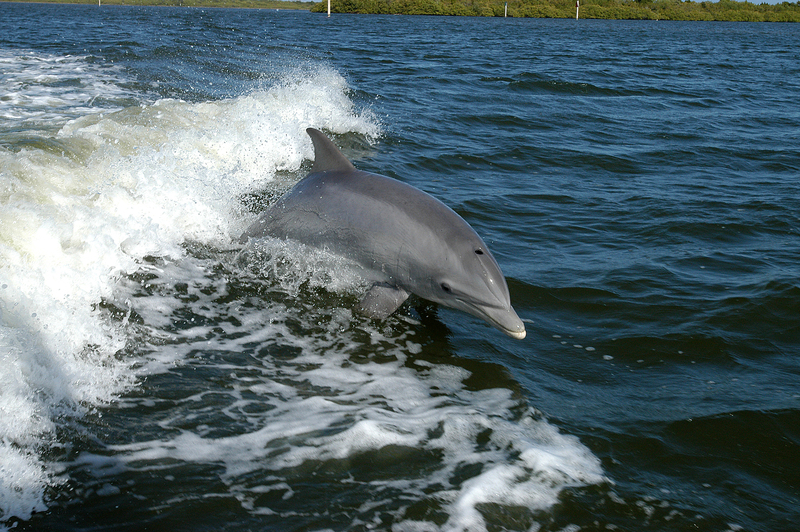 What are some of your favorite ocean activities? In Hawaiʻi there are different words to describe different kinds of water and different parts of the ocean. What is the difference between kai, wai, lihikai, ʻāpapa, kai heʻe nalu, and kai uli? Why is it important to mālama i ke kai, or take care of the ocean? Think of your favorite beach and draw a picture of it. Include labels for different parts of the kai. Where are the tide pools? Where are the surf spots? Where are the best places for swimming? Nā ‘ale ‘āpi‘ipi‘i o nā kai ‘ewalu. The rising billows of the eight seas. The “eight seas” are the channels between the islands. What role does the kai (ocean) play in the Hawaiian lifestyle? How does the kai provide for the people? The ocean is strong and powerful. It is the kinolau of Kanaloa, one of the four major gods. Kinolau means “many bodies,” and refers to the different forms that the gods can take. Kanaloa has many kinolau. He is the heʻe (octopus), the naiʻa (dolphin), even the island of Kahoʻolawe. And many more too! Kanaloa is known for giving—and destroying—life. Kānaka understood this. They have great respect for the ocean and say pule (prayers) and give hoʻokupu (gifts) before entering the kai. The kai was also a “highway” for kānaka. They did not have airplanes like we do today. They traveled between islands by canoe. Prayers were always offered to Kanaloa for a safe journey. Besides canoeing, Kānaka liked to surf and swim in the ocean too. Today, we enjoy the same kinds of ocean activities as our kūpuna (ancestors). Imagine surfing Waikīkī in the early days when the spots were less crowded. Just you and your friends surfing and having fun! That was the Waikīkī that Duke Kahanamoku grew up in. He was an Olympic swimmer and expert waterman. He even saved the lives of eight men from a capsized fishing boat while he was living in California. 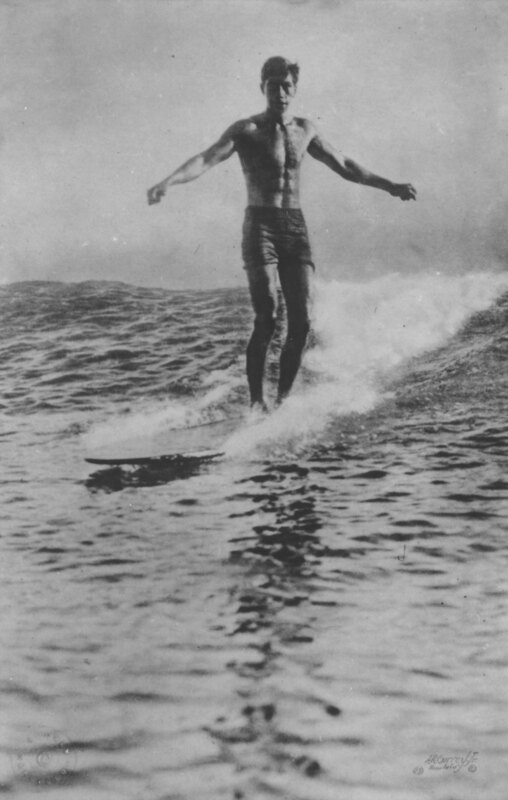 In 1917, he rode one of the longest waves ever recorded. He caught the wave from a surf spot traditionally called Kalehuawehe just outside Lēʻahi (Diamond Head). The wave ended just about where Duke's statue is. The ride was over one mile long. That distance is more than seventeen football fields! Ocean water, or kai, is used in many ways. Kai is believed to have healing properties. For example, people use it as a tonic. Often under the supervision of a healer, they drink ocean water to cleanse the inside of their bodies. Kai is also used in ceremony. Spiritual leaders use ocean water to bless newly built homes. The seawater protects the home and the families who live there. Groups such as hālau hula will go to the ocean before a major performance. They lower their bodies into the kai. They do this to cleanse their spirit. It also helps them to clear their mind. And it helps them to focus on their performance. What else does the ocean provide? The ocean is like a huge refrigerator. It stores all the iʻa (fish) and limu (seaweed) that nourishes our bodies. Traditionally, men, women, and children knew how to fish and gather. Men were responsible for deep ocean fishing. Women and children fished and gathered near the shore. People rarely went hungry. There was always enough food to feed those living in the ahupuaʻa. The skilled fisherwoman looked for pebbles scattered near a burrow in the reef. This was a sign that heʻe (octopi) lived here. She prodded the hole with her spear. No octopus. She cupped her hands and slapped the surface of the water. Hearing the hollow sound, the heʻe fled to his burrow to find protection. With one quick jab, she speared the heʻe before he could safely enter his hole. Satisfied, the fisherwoman returned home with enough heʻe in her ʻeke (sack) to feed her family. What kinds of plants live in the ocean? Ocean plants and fish are a food source. They have also been used for ceremony, healing, and offering. Limu is eaten often. It provides vitamins and minerals. One example of a limu that is still found in some places today is limu manauea. 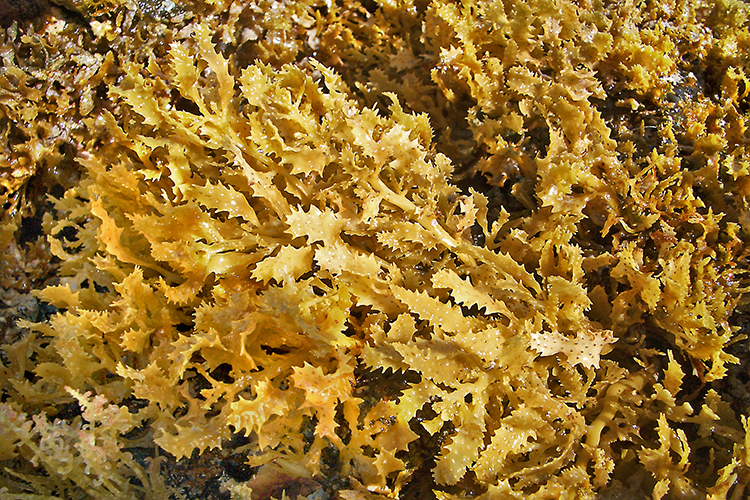 Limu manauea grows in shallow reefs. Women and children would gather it. They would use it as a garnish as we do today. Hawaiians like to add limu manauea to poke. In ancient times, limu manauea was collected using a bamboo knife. Kānaka would trim the limu from the rock, but they would leave the bottom part of the plant. This part is called the holdfast. They did this so the plant would continue to grow. Today, there is a kapu (restriction) on taking the entire limu plant. There is also a kapu on taking limu that has tiny bumps called nodes. The nodes help the limu reproduce. Limu kala is another kind of limu. It is used as a medicine. If someone steps on coral, it can be painful, and bits of coral can get stuck in the cut, causing infection. To treat this kind of cut, a poultice is made. Limu kala is collected and pounded into a pulp. The limu poultice is placed on the cut. The poultice eases the pain. It also helps to draw out the coral. Limu kala is also used for spiritual healing. Sometimes families quarrel. The kūpuna would gather young shoots of the limu kala. The kūpuna would then have ʻohana sit in a circle. Each person would receive several young shoots of the limu kala. Then the family would pray. They would ask each other for forgiveness. Then each of them would eat their limu, because kala means to forgive. There is a famous saying that talks about the limu kala: He kala nō, a hoʻi ka pilikia. Trouble leaves with forgiveness. There is a certain kind of limu called limu pakaiea. It is a relative of the sea lettuce. There is a legend that tells about the birth of a shark ʻaumakua (family guardian). When the shark was born, his human mother wrapped him in limu pakaiea and carried him to his shark father in the sea. Today some sharks have green marks on their sides. Legend tells us that these marks are traces of the limu pakaiea. What kinds of iʻa live in the ocean? Many different kinds of iʻa live in the ocean. In ancient Hawaiʻi, all were a source of food. Some were used in religious ceremony. Others were family ʻaumākua that would help the ʻohana. The kākū (barracuda) is a long silver fish. It has a jaw that juts out and is full of sharp teeth. Some kākū grow to six feet long! There are stories about the kākū. In Puna on Hawaiʻi Island, the kākū would approach fishing boats at night, attracted by the lights of the boat. They would bump against the boat. This would tell the fisher they were nearby. There are other stories about the kākū. Some lawaiʻa (fishers) would train the kākū. They would hand-feed it. The fisher would give sweet potato and ʻulu to the kākū. The kākū became tame. Then the lawaiʻa trained it to catch ʻōpelu fish. They called the kākū “Māmā ʻŌpelu.” The lawaiʻa pounded on the bottom of his canoe. Māmā ʻŌpelu would appear and follow the canoe to a school of ʻōpelu. The lawaiʻa would lower their net containing cooked, grated squash. Māmā ʻŌpelu would circle the school of fish and drive the fish into the net. The ʻōpelu would form a tight ball. The lawaiʻa would raise the net. He would grab an ʻōpelu and toss it to Māmā ʻŌpelu. This was the lawaiʻa’s way to thank the kākū for its help. Maui lawaiʻa still practice this way of fishing today. The kūmū (goatfish) is bright red. It is eaten raw, broiled, or dried. 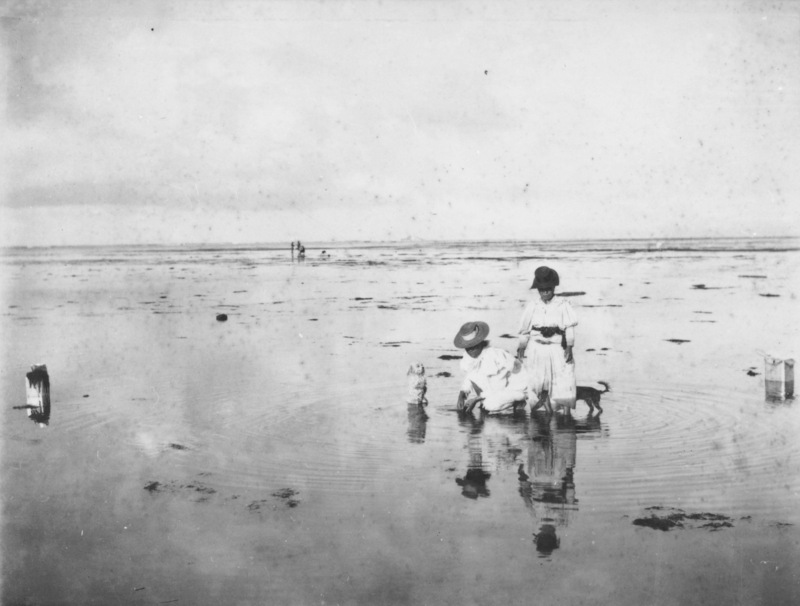 In traditional Hawaiʻi, kūmū were sometimes kept in pools of water. The fish were then available to eat or to be used in religious ceremony. There were a number of ceremonial uses for kūmū. Priests would use it as an offering. A kūmū was used at a canoe launch. It would be offered in hula ceremonies. Or sometimes it would be used as an offering to wash away people’s sins. Kāhuna would also use the kūmū if a pig were not available. There are many kinds of manō (sharks). In traditional Hawaiʻi, people said there were two types. One was called the manō iʻa, or edible shark. The other was manō kanaka, or family guardian shark. There were very few sharks that were eaten. People thought they were harmless. Sometimes these sharks would follow the fisher as he walked along the reef. The manō would look for fish that the lawaiʻa had thrown out. The manō iʻa meat was usually dried or cooked over the fire. The manō kanaka was and is still today the family guardian shark. These sharks are believed to have a human mother and shark father. Some family’s ʻaumakua is the shark. ʻOhana fed their ʻaumakua. They would give them ʻawa (a mildly narcotic drink), banana, and breadfruit. The manō kanaka protected the family. If the family fell into the ocean, the manō would bring them back safely to land. Family guardian sharks live in certain areas along the coast. They keep out predators. They protect family members. Each family has a kahu (caretaker). The kahu is responsible for feeding the shark. This is one way to make sure the family is safe at all times when in the ocean. As the men paddled toward the Kona coast, they watched the great shark following their canoe. “What do you want, old shark?” one asked at last. “Do you know that we carry paʻiʻai to Kona to our relatives? Do you eat poi, O shark? Here then!” And the man threw a small bundle toward the shark. The next week these men again paddled from Kohala to Kona with paʻiʻai, the dry, pounded kalo from which poi is made. Again the shark followed and again he swam toward the shore, pushing before him the small bundle thrown to him. This happened many times. ʻAukai’s canoe was some distance behind the larger one. He saw the men throw the bundle of food and watched the shark swim with it to a Kona beach. Then a strange thing happened. ʻAukai saw an old man come down the beach, leaning on a stick. ʻAukai watched as the old man picked up the bundle and hobbled to his house. The old man hobbled to the door. “You are welcome, stranger,” he said. “Come in, drink, and eat. Our water is a bit brackish, but it will cure your thirst.” He brought a gourd of water. Then he brought out fish and poi. “Eat,” he repeated. “Where does the shark get the paʻiʻai?” ʻAukai asked, wondering whether the man knew. And so he did. For many months the shark was given a big bundle of paʻiʻai whenever the canoe went to Kona, and the bundle was dropped for him close to the beach where the old couple lived. Then one day the shark did not come. The next week, still, he was not seen. “I shall take the food,” ʻAukai said, and he paddled straight to the old man’s village. He found the little home empty. Not even mats or bowls were there. ʻAukai went to a neighbor. “I have come to see the old man who used to live in that house,” he told him, pointing. ʻAukai paddled back to Kohala and told his friends. “The shark’s work is done,” he said. The shark was never seen again. What is our kuleana (responsibility)? The kai supplies many of our needs. It is a source of food. It is used for ceremony. Families still enjoy ocean activities. But how do we keep our kai healthy? How do we protect our ocean and everything that lives in it? How do future generations continue to maintain a Hawaiian way of life connected to the kai? Answers may be suggested by two Hawaiian words. Koʻa are coral beds. This is home to many iʻa and limu. The koʻa protects ocean life. Koa are native trees. They live in the forest. They are tall and strong like warriors. As kānaka, we need to become koa, or warriors, for the koʻa in the sea. Our kuleana is to stand strong. It is to protect our kai, just like the koʻa protects sea life.